Add some real pop to your company’s images and branding elements with three-dimensional signage. SpeedPro Imaging is well-equipped to add another dimension to your branding outreach. With our cutting-edge technology, industry-leading materials and experts positioned throughout the country, you’ll receive high-quality pieces of work wherever you go. Learn more about dimensional signs and how you can use them in your business. Dimensional signage is any sign that projects out of the wall or surface it is on. A poster is typically flat against the surface it’s hung on. A dimensional sign seems to “pop” out of the wall. The sign might consist of individually cut letters or a logo that is cut out to make it project. Some dimensional signs feature a printed, flat surface that is hung on the wall in such a way that it projects outward. When people think of dimensional signage, they often envision individually cut lettering. Although dimensional lettering is one example of this type of signage, it’s not the only example. Logos can also be created using dimensional signage techniques, for example. Dimensional signage can also be used for wayfinding. For example, an arrow that projects from the wall can help a person find their way in a busy corridor. The pictograms indicating the presence of restrooms can project outwards from the walls or doors. Who Can Use Dimensional Signage? Restaurants, medical practices, educational facilities, government entities, real estate agencies and banks are just a few of the different kinds of businesses that frequently come to our studios looking for help with their dimensional signage needs. No matter which studio you partner with, we’ll work with you to make sure the project lines up with your expectations and that you’re satisfied in the end. We start each project with a consultation, during which you’ll describe your expectations, and we’ll discuss your options in-depth. Professional offices: Dimensional letters with the company’s name can hang on the wall behind a receptionist’s desk, greeting visitors as they enter the office and confirming that they have found the right location. Restaurants: Restaurants can create dimensional signs with their logo and their name printed in big letters. The signage can hang on the exterior of the restaurant to welcome diners. In a shopping mall or plaza, dimensional signage can help hungry people identify the restaurant’s location. Retailers: Retailers can also use dimensional signage to help guide shoppers to their location. Inside a store, a dimensional sign can assist people in finding the checkout area. Dimensional signage can also be used throughout the store to guide people to different departments or to help them find the fitting rooms or restrooms. Schools and universities: Few things bring out school spirit quite like a large dimensional sign featuring a school’s mascot or logo. Universities and colleges can use dimensional signage to help pep students up for the big game and to help students feel pride in their school during the rest of the week. On a practical level, dimensional signage can help direct students to their classrooms, the offices of their professors or the financial aid office. Hospitals and healthcare facilities: Dimensional signs help people find the location of a medical practice or hospital and can help people verify that they’ve found the right place once they arrive. Signage can also help people find their way around the healthcare facility. Financial institutions: Banks and other financial institutions can use dimensional lettering to help people find the institution. Dimensional lettering can also help people navigate around a bank branch, from the loans and mortgage area to the teller area and so on. What Are the Benefits of Dimensional Signage? Dimensional signage has a few considerable benefits, especially when compared to flat signage. Dimensional lettering tends to be more readable than its flat counterpart. A sign that’s easier to read is a sign that’s more accessible and that can better accomplish its intended task. Before jumping into the features that make a dimensional sign readable, it helps to understand the challenges or obstacles the average person faces when it comes to identifying and understanding the information on a sign. Context: A sign’s location and what surrounds it can influence how visible it is and how much it “jumps out” to a viewer. Dimensional signage can increase visibility in areas where a lot is going on or where there might be other distractions, such as trees and parked cars. Speed: If a sign is meant to be read from the roadside, then size and positioning matter. When a person is driving 55 mph in a car, they travel about a quarter mile every 16.5 seconds. A person will see big, dimensional letters on a sign from farther away than smaller, flat letters. They’ll have more time to figure out what a sign says and decide if it’s what they are looking for. Font: Nearly 50 percent of respondents to a survey stated that signs with “fancy fonts” were hard to read. Although you can use cursive letters or other “fancy” lettering in a dimensional sign, it’s better to use block letters, which are more legible. Positioning: Depending on the angle at which a person is approaching a sign, they might have difficulty seeing it. For example, drivers have a limited “cone of vision,” if they keep their eyes on the road ahead of them while driving. Any sign that’s placed outside of a 10-degree cone will be difficult to see unless a driver turns their head. Beyond making a sign easier to read, dimensional lettering can also pique people’s interest in a business. One-third of shoppers have stated that they’ve gone into a business they weren’t previously familiar with because it had high-quality signs. Dimensional signage that pops out the wall and that looks good can make the difference between getting a new customer or not. Dimensional signs can also influence how people perceive your business. A new sign made of custom dimensional letters isn’t just going to grab people’s attention. It’s also likely to make them think that your company is doing well and that products or services you offer are high-quality. The better the perception people have of your company, the more likely they are to give you their business. 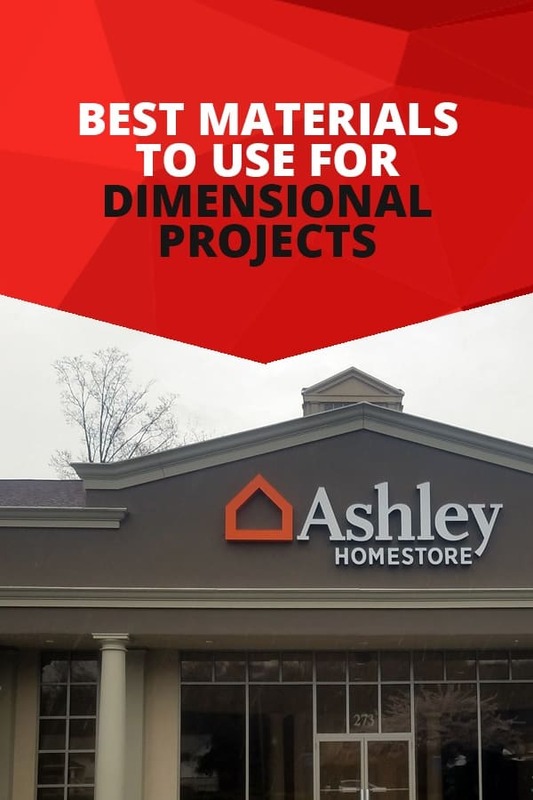 Now that you know the benefits of dimensional signage, how can you go about creating signs that attract new customers and help people find your location? There are a few rules of thumb to follow when it comes to sign design. These tips work for dimensional signs as well as any other type of sign. They can be particularly useful for dimensional signs, where high visibility and legibility is a must. Less is more: When it comes to dimensional lettering, the simpler the design, the better. A swirling, twisting script might look pretty on paper, but how easy is it to read? If you’re including any messaging on the sign, it’s also best to go as simple as possible. You want people to get your message right away when they look at your sign. Choose colors carefully: Getting the colors right is also a big deal when you’re designing a sign. The higher the contrast between the lettering and the background, the better. About 60 percent of shoppers said that signs are hard to read when the color of the letters doesn’t stand out from the color of the background. Some color combinations are also a lot easier to read than others. For example, white on blue or black on white are among the most readable color combinations. Meanwhile, red on white and yellow on red are considerably less easy to read. Get the dimensions right: How the height of the sign’s letters compares to their width matters when it comes to readability. The ideal proportions of sign lettering are a width that is approximately one-fifth the height of the letters. Choose visuals carefully: While a visual element to a sign, such as a logo or a mascot, can be eye-catching, too many visuals can distract from the sign’s message. Choose your visuals wisely. If in doubt, remember the first tip — less is more. How Are Dimensional Signs Created? The process of creating dimensional signage is slightly different from creating other types of graphics. For the most part, dimensional signs aren’t printed on material like other signs are. Instead, they are cut out from a material such as acrylic or metal using a CNC router. A CNC router has some things in common with a basic woodworking router, but it is a lot more powerful. The routers can cut intricate designs in a variety of materials with precision and ease. CNC routers also work a lot faster than other types of routers. To use a CNC router, a sign-maker programs the design into a computer-assisted design (CAD) program, then chooses the types of cutter they will use. With the information programmed into it, the CAD determines the best way to produce the signage’s design. If you want a sense of how the cutters on a CNC router move, think back to your high school math classes, specifically to when you would plot lines on a graph. Usually, the graphs you used had two axes — X and Y. Y was up and down, and X was left to right. A CNC router can cut on three different axes, which is why it can produce dimensional signs and letters. It can cut side to side, on the X-axis, as well as top to bottom, along with the Y-axis. It can also cut on the Z-axis, or up and down in the material itself. The benefit of using a CNC router for dimensional signs is that the tool makes it possible to cut and create more intricate designs than could be done by hand. CNC routers also work quickly, meaning your sign will be ready to go in a flash. Location: Some materials can better withstand the elements than others. If you’re going to use your signage outside, you might want to choose a material such as acrylic, as it’s durable and can take rain, snow and cold temperatures. Some materials, such as foamcore, are best for indoor use only. Wood signs can work well indoors or outdoors, provided they are well-sealed or are made from a type of wood that can withstand the elements. Duration or lifespan of the signage: Another thing to consider is how long you want the sign to last. Some materials are meant for temporary use, such as foamcore. If you’re creating a sign for a limited-time event, foamcore can be a good option since it’s lower cost. For more long-lasting signs, you might want metal, acrylic or wood. “Look”: How you want the sign to look influences the type of material you choose. For example, law firms and other companies might want a sign with a professional appearance. In that case, metal, such as bronze or steel, might be the best choice. A hunting lodge or camping resort might want to create a rustic ambiance, in which case, a dimensional wooden sign can be ideal. Cost: Some materials cost more than others. If budget is a concern, you might want to choose a more cost-efficient material, such as foamcore. Your overall aesthetic: The material you choose for your sign can coordinate with other design elements at your business. For example, if you pick metal, you can select a metal that coordinates with fixtures such as doorknobs or other detailing in your office. Foamcore or acrylic signs can incorporate your company’s signature colors. Acrylic: Acrylic offers a bold, immediately recognizable element to your office space. It’s an incredibly versatile material, as we can use features to fit a range of sizes, shapes and colors. You can add a dimensional flair to your logo or create some interesting decorative elements. Acrylic dimensional signs can be used indoors or outdoors. They are lightweight and can resist fading, chipping and cracking. Foamcore: If you’re looking for an option that’s cost-efficient, lightweight and temporary, it’s hard to beat foamcore. You can even extend its lifespan with a series of different finishes and coats. Foamcore is best for interior signage. It’s an ideal pick for trade shows, conventions or any other event when you want to grab people’s attention quickly. Metal: Aluminum and other malleable metals like copper, bronze and steel are all fair game for companies seeking industrial, hardened overtones. Metals can also be finished and polished in a variety of ways, and the durability they offer is second to none. Metal signage is excellent for indoor use or outdoor use. Wood: Sometimes you can’t beat the old-fashioned, natural ambiance wooden signage helps to inspire. Many popular wood types can be cut to fit your requirements, which also means they can be made to withstand indoor or outdoor use without significant wear and tear. Although wood can be used to create a rustic, it can also be used to create a polished, professional sign, depending on the finish and style. Are you looking for dimensional lettering or signage to make your business stand out or to attract new customers? SpeedPro Imaging can work with you to create custom signage that reflects the aesthetic and identity of your company. Our products are cut with precision using the latest CNC router technology, and the appearance can be matched to pair with your other visual elements flawlessly. While people often think of dimensional signage as merely decorative, it can suit a variety of other applications and fulfill functional needs as well. When you’re ready to take your visual communications to another dimension, contact your local studio to schedule a consultation.